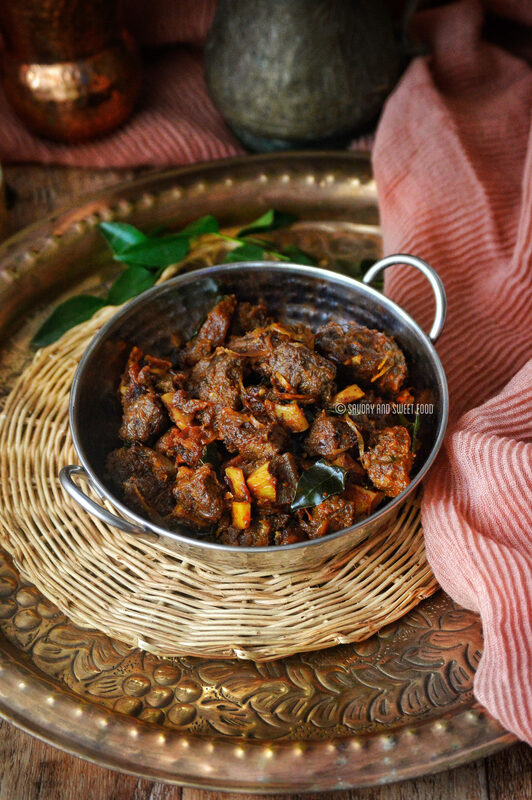 A Kerala style beef fry which is not for the faint of heart. It is very spicy and is fried in quite a lot of coconut oil giving this dish a very traditional aroma and taste. 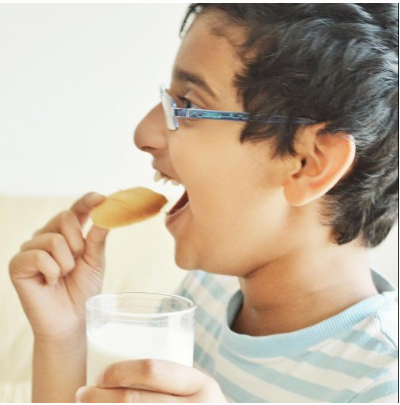 My hometown Kerala, though very small on the map is actually the ultimate place for food lovers. Kerala will take you on a gastronomical journey of mind blowing food items which are unique and gasp-worthy. 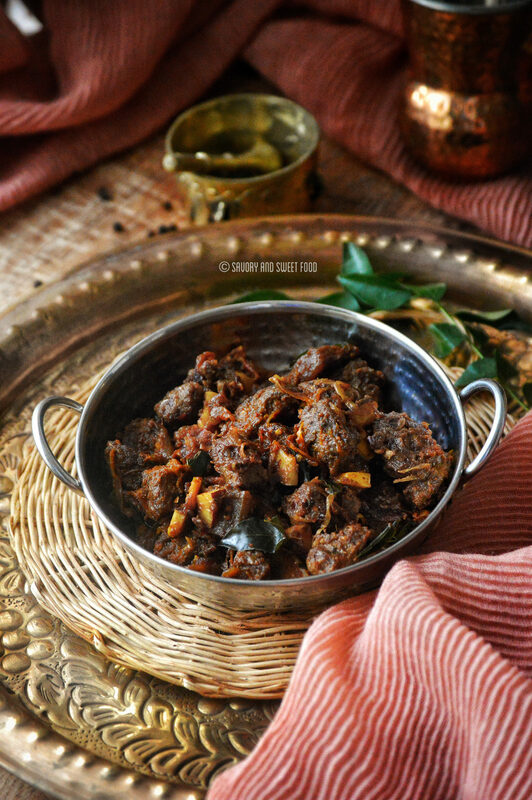 This delicious Naadan Style Beef Fry in many ways, defines how Kerala cuisine is. The strong flavors of this dish will forcefully make you fall in love with it. 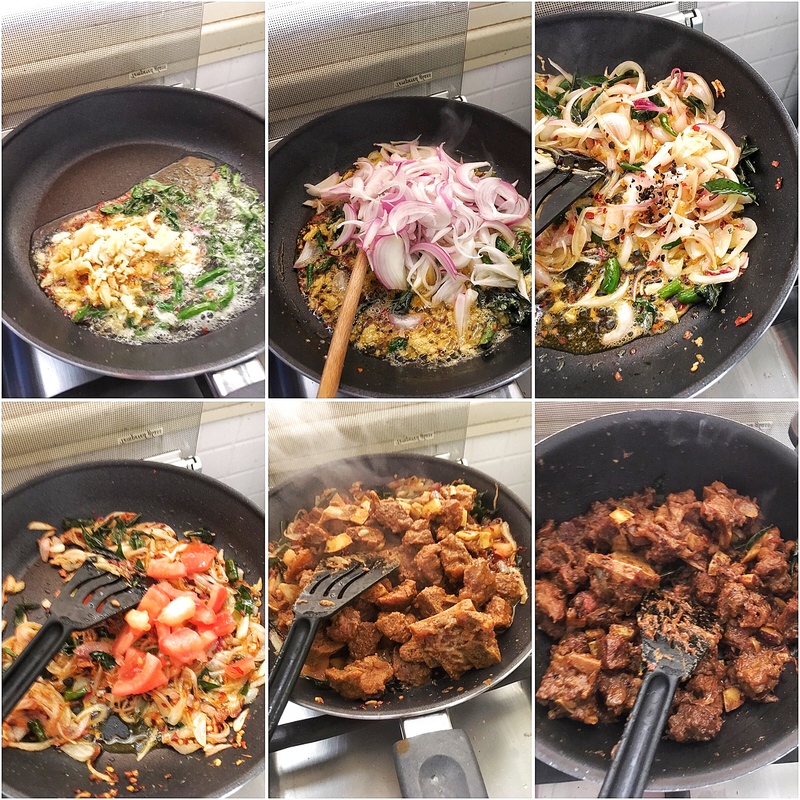 This beef fry is also called ‘beef ularthiyath’, which means, cooked over direct heat on a griddle with lots of oil till the meat gets dried up and and all the masalas get stuck onto the meat. The aroma that fills the house while making this is simply awesome. You guys should definitely make this one at home. This will surely be a winner. 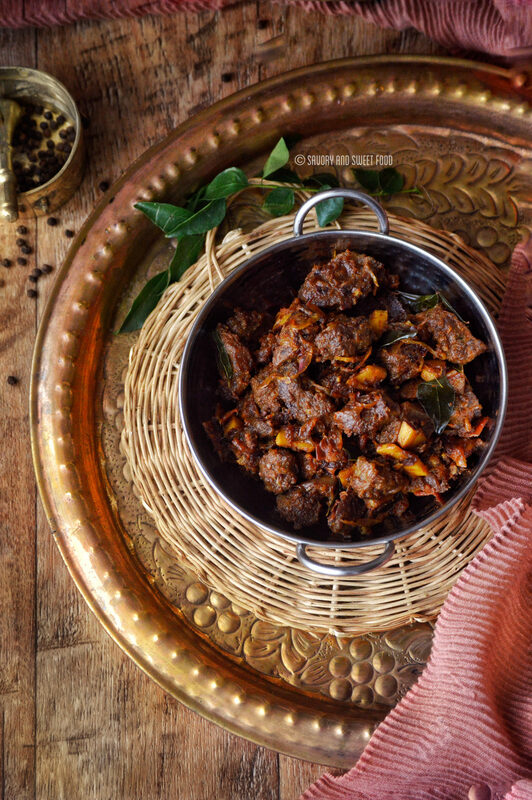 If you don’t eat beef, you can follow this same recipe with mutton. 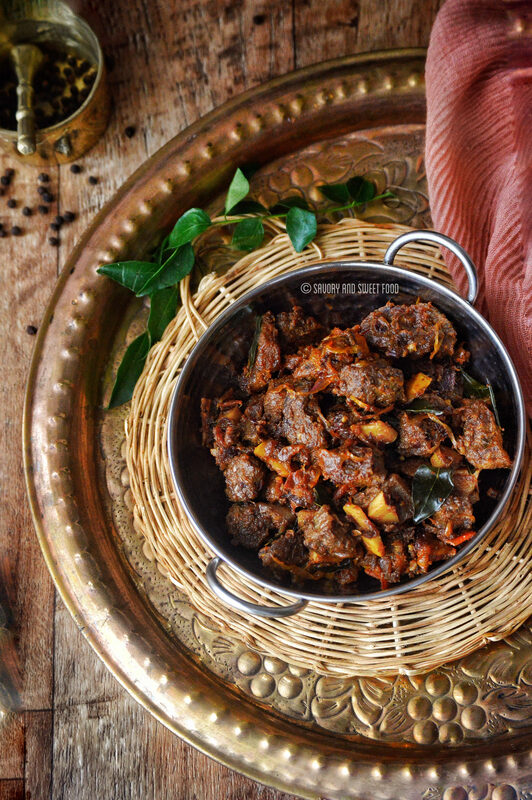 I am sure that all will be singing praises after having this A-class plate of Kerala Style Beef Fry. Grind all the ingredients listed above into a coarse paste. 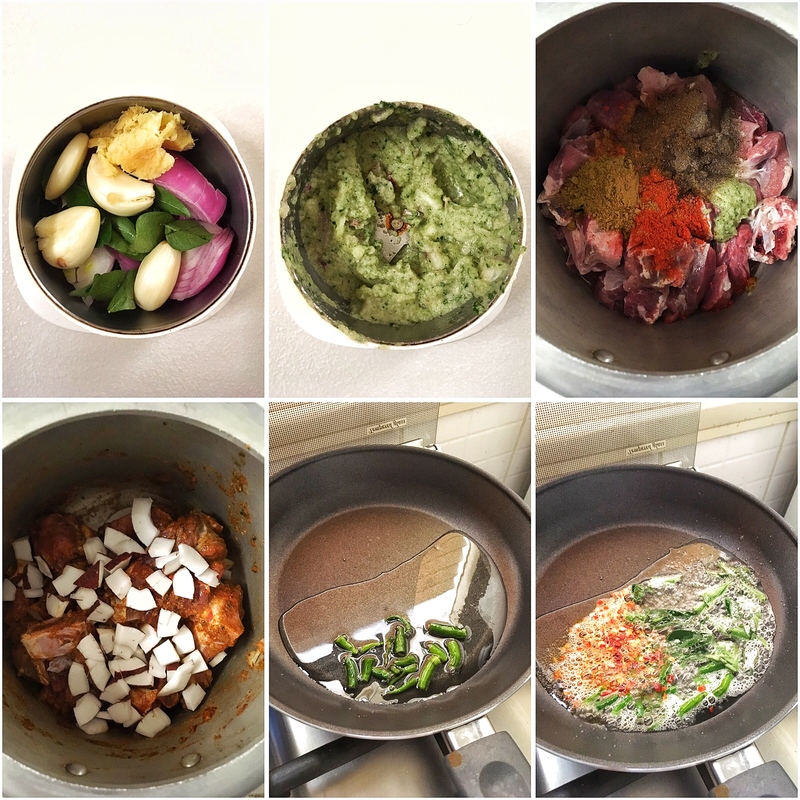 In a pressure cooker, add in this ground mix along with beef , red chili powder, turmeric, coriander, garam masala, pepper powders, vinegar, coconut pieces and salt. Close the lid of the cooker. Cook on high flame till pressure releases once. After first whistle, reduce heat to low and cook for 20 minutes or till beef gets cooked through well. Turn off the flame and let the pressure release on its own. Open the lid and if there is excess water in the cooker, then increase heat to high and let it dry out. Meanwhile in a frying pan, pour in coconut oil and add green chillies. Sauté for few seconds and then add curry leaves. Add in ginger and garlic. Sauté till the raw smell disappears. Drop in the sliced onions and sauté till it turns golden brown in color. Add in crushed pepper corns and tomato. Cook till tomatoes turn soft and mashed. Add the cooked beef into this. Cook on high heat stirring continuously till the beef turns black in color (not burnt 😉 ). You can add in more oil during this step for more flavor. Kanditt kothiyakunu Sadia….Btw stunning photos too!!!! Aww thank you so much Sherien. nfident in the magic touch of cooking …. Can you please advise what “Ground mix” is, I would like to try this recipe for my husband, but am unsure what this is.